Grand Geyser Group: Yellowstone National Park, September 2003 We were fortunate enough to see an eruption of Grand Geyser, the tallest predictable geyser in Yellowstone. Its eruptions can reach a height of 200 feet, and it erupts in a series of multiple bursts, anywhere from 1 to 4 at a time. 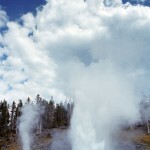 There are two other smaller geysers (Vent and Turban) tied to Grand erupting in this photo as well. This entry was posted on February 25, 2008 at 12:31 pm.